Prainha, stretching among the cliffs with astonishing views over Alvor bay, is the perfect scenery to relax and spend some unforgettable holidays with the guarantee of unique moments, experiences and emotions. Gathering Prainha Village with apartments and villas from 1 to 4 bedrooms with or without private pool and Prainha Clube touristic apartments, (studios to 2 bedroom apartments) renewed in May 2010, Prainha is a paradise by the sea as confirmed by the preference of our guests over the last 45 years. The Atlantic pool on the top of the cliff overlooking the sea, Prainha exclusivity assured by the direct access to the beach by a lift built on the rocks (unique in Algarve), Caniço Restaurant & Beach bar also built on the rocks and highly recognized by the excellent meals and unforgettable beach parties are some of the highlights that make this resort perfect for holidays with family, friends or just to relax. 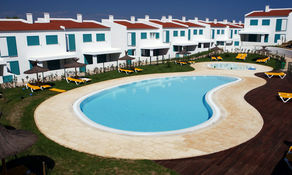 Studios or apartments perfect for your holiday in the Algarve! Apartments and villas for those who want a lot of space!